Lariat Biosciences was founded around the vision of pre-diagnostic cancer screening. This application, also known as the liquid biopsy, promises the detection of cancer from a non-invasive blood draw. Through Lariat’s proprietary workflow, cancer would be found at its earliest stages when biomarkers are yet invisible to existing diagnostic methods, allowing for more positive patient outcomes. Lariat has tailored core capabilities in genotyping assays and advanced microfluidics, combining each to meet the needs of cancer detection at the most sensitive levels. Existing liquid biopsies are limited to later stage cancers when the circulating tumor DNA (ctDNA) is abundant in the bloodstream and can be easily distinguished from healthy wild-type DNA. In early stage cancer, only a small number of individual ctDNA molecules may be present, and they may be outnumbered by 100,000-to-1 or more by nearly identical wild-type DNA. To achieve the high sensitivity and ultra-high specificity required for early stage detection of ctDNA, Lariat is developing the enrichment scheme shown above. In RVE™, purified circulating DNA from a patient sample is diluted and emulsified by a microfluidic device (see example) such that each droplet contains at most a single DNA molecule. By separating each individual DNA molecule into its own microdroplet environment, each molecule can be amplified within its droplet unimpeded by competing reactions (a process known generally as unbiased amplification by emulsion PCR). While microdroplets are excellent in use as transient pico-sized test tubes for one-pot reactions like DNA amplification, they are unsuitable for general multi-step biochemistry. As one simple example, the product of a droplet-based reaction cannot readily be washed, a crucial limitation for most of conventional biochemistry. RVE™ liberates the products of emulsion PCR, allowing basic washing steps but nevertheless maintaining co-localization of the clonal DNA. We accomplish this by capturing the amplification contents from each droplet into a hydrogel microparticle. One-by-one, each droplet is injected with a gel pre-polymer solution using Lariat’s proprietary bridge-mode injector shown below. As the gel solidifies, the amplification products are covalently captured into the growing polymer chains. In essence, RVE™ practically immortalizes the genetic sequence from a single molecule into a microparticle impregnated with millions of copies of the original sequence. Genotyping clonal microparticles is vastly easier than genotyping single DNA molecules, nevertheless traditional genotyping strategies like fluorescence hybridization and primer extension struggle with specificity inside the confined environment of pores within microgels. 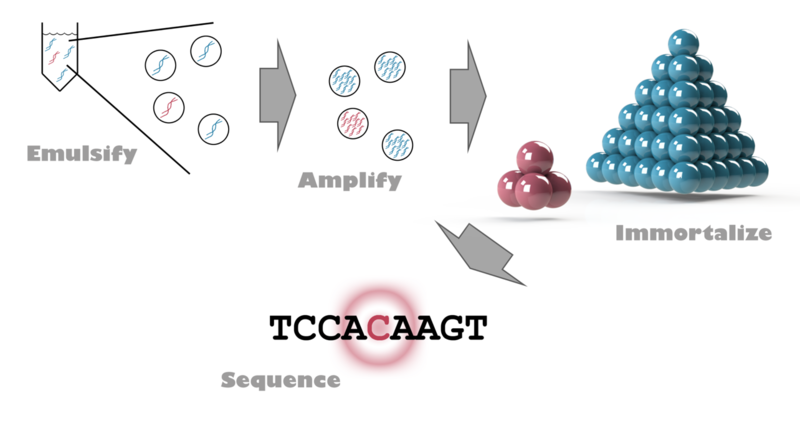 Lariat has invented proprietary genotyping assays for both single nucleotide polymorphisms (SNPs) and small insertion / deletion mutations (indels) that are specifically tailored for microgels. The figure to the right shows successful genotyping of a SNP within microgels. 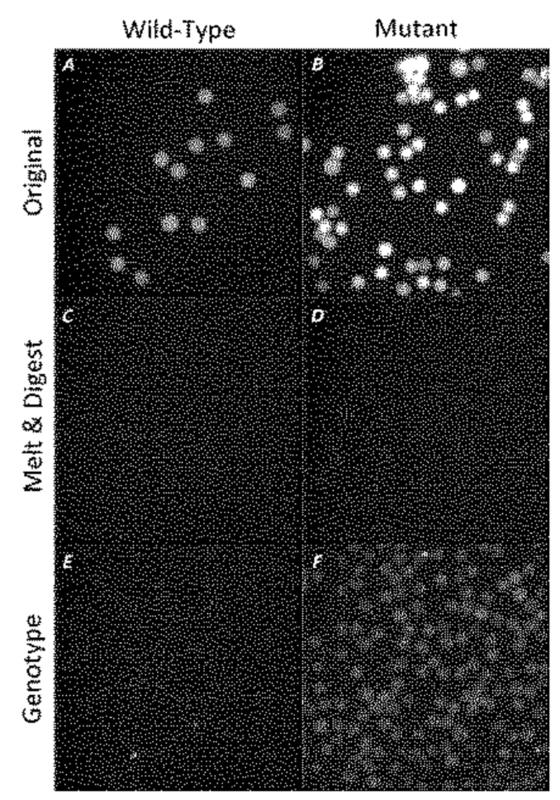 Microgels with the mutant DNA are fluorescent (panel F), wheres those with the wild-type DNA are not (panel E). Enrichment of the mutant DNA is the next step in RVE™. Fluorescent mutant microgels are separated from the abundance of wild-type microgels by any commercially available fluorescence-assisted cell sorter (FACS). Once isolated, the mutant DNA can be released from the particles for sequence confirmation and identification. In this manner, RVE™ can be considered as an unbiased enrichment workflow that prepares samples for efficient sequencing.